Today Diwali, Divali, or Deepavali is celebrated by Hindus, Jains and Sikhs across the globe as the "Festival of Light," where the lights or lamps signify victory of good over the evil within every human being. While Deepavali is popularly known as the "festival of lights", the most significant esoteric meaning is "the awareness of the inner light". Central to Hindu philosophy, is the assertion that beyond the physical body and mind is pure, infinite, and eternal, called the Atman, the Supreme Self. Just as we celebrate the birth of our physical being, Deepavali is the celebration of this Inner Light, in particular the knowing of which outshines all darkness (removes all obstacles and dispels all ignorance), awakening the individual to one's true nature, not as the body, but as the unchanging, infinite, imminent and transcendent reality. With the realization of the Atman, comes universal compassion, love, and the awareness of the oneness of all things (higher knowledge). This brings Ananda (Inner Joy or Peace and Bliss).
. Diwali @ UCLA: At UCLA campus we also had Diwali celebration by Indian Community. unfortunately i couldn't join due to exam preparation etc, but just read about it in the Daily Bruin. you can also watch a short video from the event inside the featured news.
. sweeet recipie for diwali and another Really yummy one! 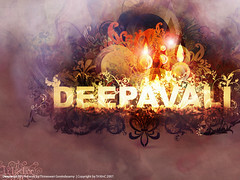 Wishing you a very happy and blessed Deepavali. May we all be touched and awakened by our Inner Light.